Summer Seventeen: St. Ives Mixing Bar Pop-Up Shop in NYC! Being a huge fan of St. Ives circa way back then, I was super stoked when I was invited to get a first peek of their pop-up shop in SoHo before it opened its doors for the public. St. Ives Mixing Bar is located in SoHo at 577 Broadway and is now open for six weeks throughout the summer (until July 30th). What are you waiting for? You totally need to check it out... now. 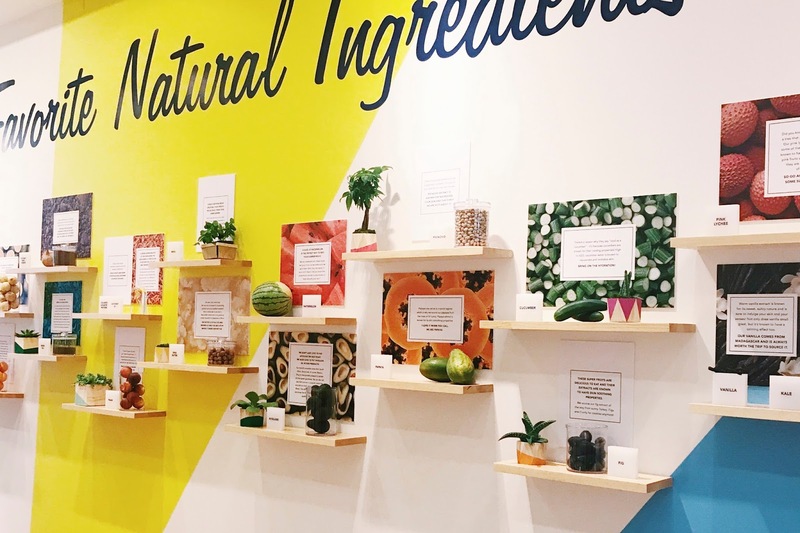 You'll automatically fall in love with the live educational ingredient wall on the left as soon as you enter the doors. 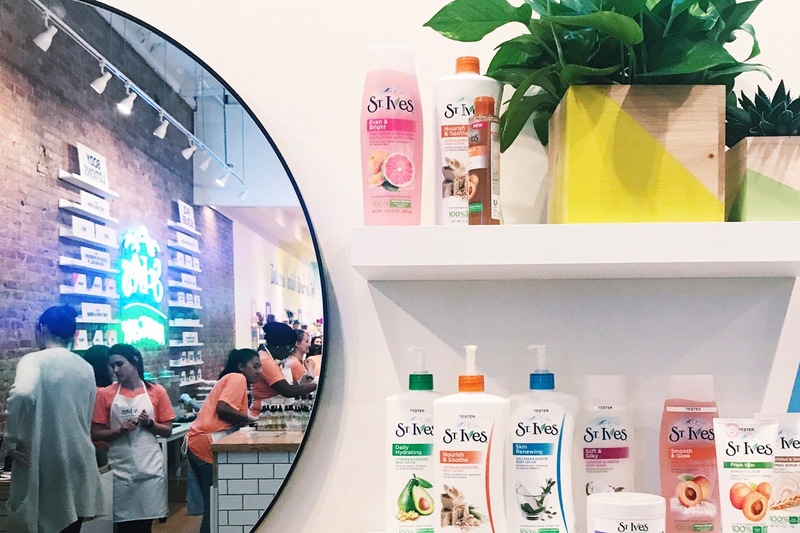 I love that St. Ives uses natural products, and this is definitely a playful way to showcase that! There are also fun and colorful installations displayed on the right, and this is where my mind kept telling me, "do it for the 'gram!" and so I snapped a bunch of photos, of course. Speaking of photos, there's also a mirrored infinity room filled with life-sized apricots that you'll adore. Well, what's the Mixing Bar all about? Um, where do I even start? The Mixing Bar is an interactive store where some (if not all) of your senses come to life. You can create your very own custom St. Ives Face Scrubs and Body Lotion (for $12 each) with exclusive ingredients! Think, Watermelon Agave and Coconut Pink Lychee... *drools. The custom face scrubs really cater to your skin type and personal preferences. You have the option to choose your own exfoliation level - gentle (rice powder), moderate (coconut shell powder), or deep (walnut shell powder). Then, you get to choose the ingredients that go into your custom face scrub! These ingredients come in pairs - Avocado Honey, Pineapple Mango, Watermelon Agave, Coconut Cacao, Blackberry Basil, and Cucumber Kale. They all sound so good, but first, you need to go to the store and take in a whiff of each combo because they are killer (in a good way). Trust me, I had trouble choosing one (and I am about to go back there and get another). Each pair of ingredients have their own benefits, which will (hopefully) help you narrow down to your perfect pair! I ended up going with Gentle exfoliation with Cucumber Kale ingredients to help revitalize and smooth my skin! Smells amazing - kind of like a green juice for your face. Michael went for a Deep exfoliation with Watermelon Agave ingredients to help detoxify his skin. I'm definitely going to go with the Watermelon Agave next - maybe with a Moderate exfoliation level? For the custom body lotion, you start by choosing either a light or rich thickness, and follow up with choosing two ingredients for your skin to love. I didn't get a chance to create my own St. Ives body lotion, but I will definitely be back this summer for one. I already know that I'll want something with papaya or pink lychee! There are sinks in the back of the store filled with St. Ives products that you can test out as well! You can view their menu on their Mixing Bar page, here - just scroll down! Oh, and they also have specialty candles on sale (for $10 each) with yummy scents like Apricot Honey and Blackberry Basil! If you're in NYC or visiting NYC this summer, be sure to check this place out. Your glowing skin will thank you!